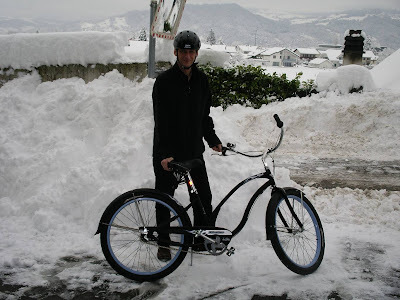 who also cycles in the snow! Thomas is an industrial designer from Thun, Switzerland, who is also one of the world's top baristas (I believe he told me he was rated 17th best barista in the world). 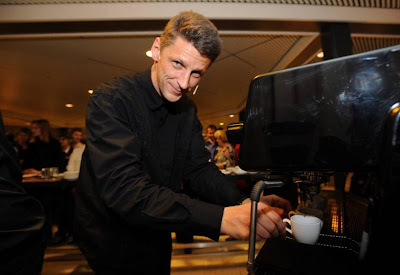 He won a design award in Switzerland for a laser he invented, but he's also known for designing a machine that he claims brews the best espresso you've ever tasted, especially when he's behind the bar! My last day in SF I visited a Blue Bottle coffee shop. I enjoyed a real delicious fresh brewed long coffee. The blend was The Three Africans. Maybe next time Thomas visits us, Lilia, Meli and I can take him on a Tour de Café de SF. Any suggestions for our itinerary? Ultimate combination, lovely man of great trades. Long live Coffee bike lovers-Please do keep me posted, will def. take you up on that any day!! keep awesome posts (+boys) like these rolling!